Charged with murder in the death of the Bearcat, Bill “Kid” Collins is granted permission by the courts to enlist in the army as a means to offset the costs of the trial as well as circumvent his lengthy prison term. During medical evaluations Bill is in impeccable physical condition but is immediately rejected due to his pronounced mental instabilities and his difficulties in adjusting to military lifestyle. This designation has forced him into his first of many extended stays in psychiatric facilities. Not a fan of confinement nor authority, our leading man is quickly on the loose with no one to trust and not a lot of places he can hide. Like a vicious cycle, Bill is constantly taking up and escaping residence in various mental institutions, traveling to a new town every thousand miles that end up being a carbon copy of the one he just left. With the same rundown bars, the same clueless schemers, and the same potholed roads, you would think it would be wise to hedge his bets that nothing better is out there and to just settle down in one spot. The thought is unlikely when you have episodes of psychosis, are continuously paranoid of uniforms, and have a penchant for violence. With these psychological symptoms, delusions will direct you to the next city when the reality of something better is foolishly-romanticized. Bill has certain look of bad news, a disposition that causes concern among civilians, couple that with a national reputation as a killer, it’s best not to overstay your welcome wherever your hat may lay. What a busy mind are friend Bill has. You thought his feet were constantly on-the-go, well his head has been working overtime for quite some time now. Traveling south to another town with no name and a bar with peeling wallpaper, “Kid” is quickly on the bad side of the local barkeep without an utterance of a single word. Lucky for him a woman named Fay Anderson takes him home, unlucky for him she has heard of Bill Collins. Just about everything happened that day. Just about everything seemed to go wrong. It was the day the boy almost died. It was the day Bert tried to kill Uncle Bud. It was the day I Robbed Doc Goldman’s office. It was the day Fay tried to – to what? Everything happened. Everything went wrong. Taken to the comforts of home by Fay, she introduces “Collie” to a municipal ex-cop Garret Stoker who insists on being referred to as Uncle Bud. Bud knows his stuff about boxing and knows plenty about “Kid” Collins which would normally make “Kid” sweat a little bit, but Bud reassures him that his secret is safe with him. After a few laughs and a lot of drinks it becomes apparent that Fay has plenty in common with “Kid”. With every moment of clarity there are two moments of madness. At one point Fay is protecting “Kid” telling him to get away from Bud, at other points Fay is denigrating “Kid” knowing full well how dangerous he can be. Fay even seduces him to the point of head-spinning confusion, making it difficult for “Kid” to understand who the real Fay is and how he should handle her bi-polar tendencies. After a while Bud seems to be the least confounding character of the bunch, but when you throw money into the equation the crazy seem to get a little crazier while even the straightest lace becomes a little more bent. 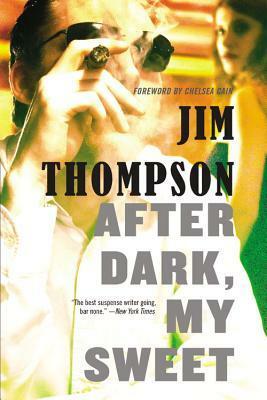 I am really a big fan of Pop.1280 and was looking forward to reading my next Jim Thompson book. Pop.1280 was dark, grimy, hilarious… awesome. With that experience I was expecting much of the same and had a good idea that Jim would have some surprises in store. After reading I felt that this book failed to live up to my heightened expectations. I liked the idea of a tortured soul going through township to township staying at arms length of people who may provoke him and assist in sending him back to the facilities he is so quick to flee. Ultimately I found this novel to be underwhelming. It did have its trademark moments, but they were too far and few between for my liking. It has all the elements of a hard boiled, pulpy, noir novel that was achieved before it became a mass market cliché. And to that point he has set the foundation for this genre that the likes of Vachss, Clevenger, Hiassen, Swiersczynski have built on. Jim Thompson is the man. I have a few more of his books to read and I am very much looking forward to devouring them. Next up The Killer Inside Me mwahahahaha, hopefully it’s more to my expectations.